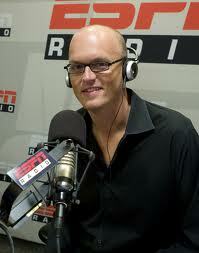 May 16, 2012 - Scott Van Pelt confirmed the rumors that he will be staying at ESPN and continue to host his afternoon radio show, anchor "SportsCenter" and host the network’s golf coverage. Van Pelt has been a favorite sports media star and had been courted by other sports networks like NBC and Comcast. Van Pelt began his career in sportscasting at WTTG-TV, a FOX affiliate in Washington, D.C. in 1990 and then moved on to the Golf Channel, where he worked from 1994 to 2000 as a studio host for some of the network's signature programs. He left the channel in 2001 to join ESPN, where he serves as an anchor for SportsCenter and is one of the network's top golf correspondents, covering major tournaments such as The Masters and the British Open. He also is a prominent personality for ESPN Radio, where he was the co-host of "Tirico and Van Pelt" alongside Mike Tirico before the program was canceled and replaced with Van Pelt's own three-hour program, "The Scott Van Pelt Show," in 2009.